Are you looking to make a perfect Doll House or perhaps get some interior design inspiration for your home? Certain combinations of colours and shapes just work better together than others. Luckily, many popular blogs today and Internet sites like ours at Strongholdminiatures.co.uk have gathered some super cute miniature houses with such fine details that are truly amazing to look at. 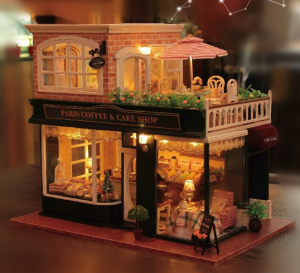 There are miniature houses with realistic indoor details such as designer furniture, paintings, and lights. Outside can be finished with a real-looking garden with various beautiful blooming plants. Making and decorating miniature houses have become a popular hobby, which attracts different kinds of people – even those who do not have children to play with them. 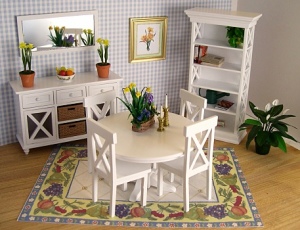 It is a very rewarding way to release your inspiration and try interior designs and decorations in a miniature form. Many blogs list inspirational miniature houses as well as tips for creating your own. Decorating and interior design is a very popular blogging topic and looking at the beautiful pictures and advice will get your own inspiration pumping. Pinterest is similarly a good site to look at for miniature house inspiration. Several users around the world have uploaded their photos of pretty miniature houses either of their own design or something that inspired them. The key words “miniature houses”, “dollhouses”, “miniature furniture”, and “miniatures” generate thousands of hits for lovely and colourful images of finely detailed miniature houses. Once the idea is there, it helps to look for tutorial videos from example from YouTube. There are plenty of videos showing exactly how the detailed decorations and innovative creations have been done. Tutorials often include the best materials to use as well as how to work with them. Mini versions of furniture can be easily made at home. This will need tools for detailed cutting and powerful glue to put the furniture together. For those who do not have the time, patience, or creativity to make their own miniature furniture, there are also specialised and online shops, which sell unique pieces of tiny furniture for all tastes from modern to antique. You will be surprised to find anything you could think of available for your miniature house from furniture to carpets, pillows, tablecloths, kitchen towels, kitchen gear, and lightning, just to start with. If there is no suitable colour available, small buckets of decorative paint from your closest craft shop will do the trick. When you paint the furniture yourself, you get a more creative project out of it and can be sure every colour and pattern is exactly as you hoped it to be. Get Creative and Have Fun With It! Miniature houses are a truly exciting trend, bringing out creativity and making families work together on a mutual project. This is a fun way of converting ideas into reality and testing limits of innovation. Do not be shy to share your project online, as there are many people likewise looking for inspiration… just like you!